Explore paint colors for your home with our new easy online tool. Get everything you need to paint in one trip or delivery is FREE. Minimum purchase of one gallon paint required. Call participating store to schedule free delivery within the delivery area, subject to availability, and pay for additional items. Click here for complete limited guarantee terms & conditions. Free delivery of in-stock paint, sundries or cleaning products that were not offered to you on your first visit, within a delivery area determined by the participating Store that sold you the gallon of paint. If free delivery is not available for any reason, we reserve the right to provide you with a gift card as an alternative to free delivery. The cost of the products that were not sold on your first trip. You must purchase the products that are to be delivered. Products that are not within the paint, sundries or cleaning categories, as determined by us. Delivery outside of the delivery area as determined by the Store that sold you the gallon of paint. Within thirty (30) days of your original purchase, call the Store that sold you the gallon of paint and notify the manager of the type of paint, sundry or cleaning products that were not offered to you on your first visit and request delivery of those items. The Store manager or associate will identify those products for you and, with your permission, sell those products to you over the phone and deliver them to your residence.The delivery time will be determined by the Store manager or associate. Upon delivery, you must show the Store associate your original receipt of the purchase of at least one gallon of paint. Contact the Store that sold you the gallon of paint for store specific details. THIS LIMITED GUARANTEE GIVES YOU SPECIFIC LEGAL RIGHTS, AND YOU MAY ALSO HAVE OTHER RIGHTS THAT VARY FROM STATE TO STATE. ACE'S AND ITS MEMBERS' SOLE RESPONSIBILITY FOR FAILURE TO OFFER TO SELL YOU EVERYTHING YOU NEED FOR YOUR PAINT PROJECT IS LIMITED TO FREE DELIVERY OF THOSE ITEMS, AS SET FORTH IN THIS LIMITED GUARANTEE. 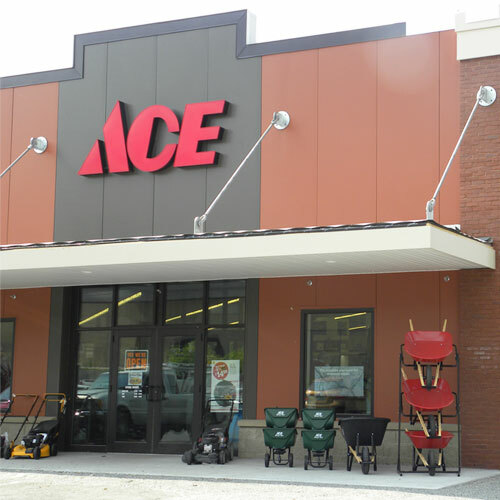 ACE AND ITS MEMBERS RESERVE THE RIGHT TO LIMIT THIS PROMISE IN THE EVENT OF SUSPECTED FRAUD OR ABUSE, AS DETERMINED BY THEM, AND THEY DISCLAIM ALL EXPRESS AND IMPLIED WARRANTIES. ACE AND ITS MEMBERS DO NOT ACCEPT LIABILITY BEYOND THE REMEDIES SET FORTH IN THIS LIMITED GUARANTEE OR LIABILITY FOR INCIDENTAL OR CONSEQUENTIAL DAMAGES. SOME STATES DO NOT ALLOW LIMITATIONS ON IMPLIED WARRANTIES, OR THE EXCLUSION OR LIMITATION OF INCIDENTAL OR CONSEQUENTIAL DAMAGES, SO THE ABOVE LIMITATIONS MAY NOT APPLY TO YOU. EXCEPT WHERE PROHIBITED: (A) ANY AND ALL DISPUTES, CLAIMS, AND CAUSES OF ACTION ARISING OUT OF OR CONNECTED WITH THIS GUARANTEE SHALL BE RESOLVED INDIVIDUALLY, WITHOUT RESORT TO ANY FORM OF CLASS ACTION OR OTHER LITIGATION, AND EXCLUSIVELY BY FINAL AND BINDING ARBITRATION PURSUANT TO THE RULES OF THE AMERICAN ARBITRATION ASSOCIATION, THEN EFFECTIVE, AND HELD AT THE AAA REGIONAL OFFICE NEAREST YOUR LEGAL RESIDENCE; (B) THE FEDERAL ARBITRATION ACT SHALL GOVERN THE INTERPRETATION, ENFORCEMENT AND ALL PROCEEDINGS AT SUCH ARBITRATION; AND (C) JUDGMENT UPON SUCH ARBITRATION AWARD MAY BE ENTERED IN ANY COURT HAVING JURISDICTION AND (D) ANY AND ALL CLAIMS, JUDGMENTS AND AWARDS SHALL BE LIMITED TO ACTUAL OUT-OF-POCKET COSTS INCURRED, INCLUDING COSTS ASSOCIATED WITH THIS GUARANTEE BUT IN NO EVENT ATTORNEY'S FEES; AND (E) UNDER NO CIRCUMSTANCES WILL YOU BE PERMITTED TO OBTAIN AWARDS FOR PUNITIVE, INCIDENTAL, CONSEQUENTIAL OR ANY OTHER DAMAGES, OTHER THAN FOR THE ACTUAL OUT-OF-POCKET COSTS MENTIONED ABOVE. ALL ISSUES AND QUESTIONS CONCERNING THE CONSTRUCTION, VALIDITY, INTERPRETATION AND ENFORCEABILITY OF THESE TERMS, OR THE RIGHTS AND OBLIGATIONS OF YOU AND ACE IN CONNECTION WITH THIS GUARANTEE, SHALL BE GOVERNED BY, AND CONSTRUED IN ACCORDANCE WITH, THE SUBSTANTIVE LAWS OF THE STATE OF ILLINOIS.